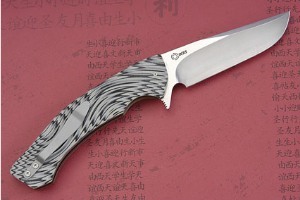 The 12C27 stainless steel blade has been hand satin finished on the grinds and mirror polished on the flats. This accentuates the unique, crisp grind lines. 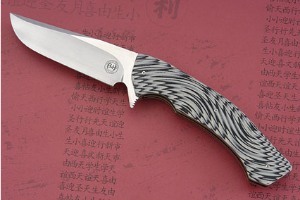 The blade is easily opened with a simple flick of the wrist or using flipper mechanism. The blade is well centered and has silky smooth action, due to the IKBS (Ikoma Koth Bearing System) pivot system. This mechanism, which was originally designed to fit balisong knives, uses ball bearings to create smooth action with no blade play. 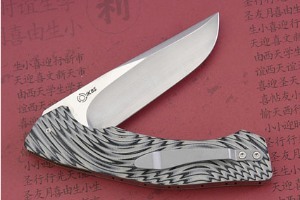 3D textured G10 provides a sure, comfortable grip. 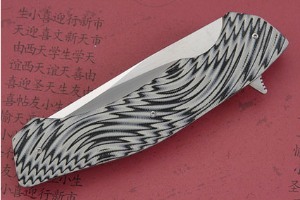 Anodized titanium liners and a titanium backbar keep the knife light and fast. 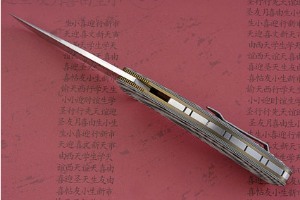 It is easy to keep this handmade folder close at hand with the pocket clip. Excellent fit and finish throughout!